Discussion in 'Bonus Spins - Extra Spins - No Deposit Bonuses' started by Marina, Nov 29, 2013. 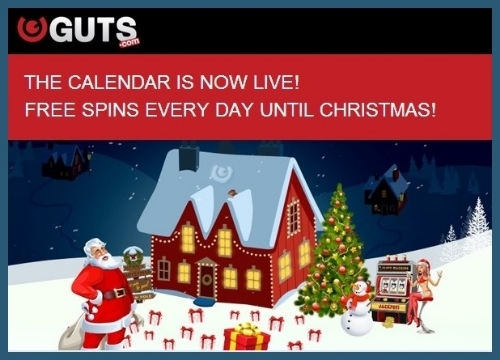 Guts Casino Christmas Calendar 2013 is live! Free Spins every day until Christmas! Of course Guts has a super promotion! Until Christmas they reward their active, depositing players with DAILY FREE SPINS! To start off I received already some freespins on Starburst today! Go check if you got the free games too! you’re automatically eligible for the daily Christmas Free Spins from Guts Casino. by Saturday 30 November 2013 23:59CET and you’re getting spoiled this Christmas. Or make a qualifying deposit anytime during December and you will be eligible for the free spins the next day forward. Double your Guts Christmas free spins! then your free spins will be doubled. For example make a deposit Saturday before 23:59CET and your free spins on the 1st will be doubled. Of course there is no wagering on the winnings from the free spins at Guts.com! The Guts Casino Christmas Calendar had for me today 5 Free Spins on Gonzo's Quest! I love the guy from Gonzo's Quest! I have free spins on Piggy Riches Slot Machine! NICE! The freespins are not credited yet, I assume they will be there a bit later. Very nice, Marina! Good luck to you & every1! Yippie! The Guts Christmas Calendar gives me today 15 Free Spins on Dead or Alive! Guts Casino Christmas Calendar offers free spins on Creature of the Black Lagoon today! Have you played your Christmas Calendar Freespins for today in your Guts Casino ? The spins are on the NetEnt slot Subtopia today. Ho, ho, ho at Guts Casino today.